RapidMiner is a suite of tools that provides a centralized solution for creating, delivering, and maintaining predictive analysis for business. It features a robust graphical user interface that provides a powerful way of operating the platform. This application ensures an unhindered process from modeling to implementation and also utilizes rich technology useful on projects for advanced data analytics. RapidMiner not only works for predictive analysis but also for application integration, data integration, machine learning, and transformation. This allows the system to provide a unified approach that will give businesses an edge in boosting their efficiency and productivity through accelerated learning and improvement in standardization. RapidMiner’s tools and features offer powerful capabilities for the users while at the same time are presented through a user-friendly interface that allows users to perform productively in their works from the start. Thus, each of the tools’ robust components is easy to be operated. One feature of the system is the visual workflow designer which is a tool that provides a visual environment to the users. This environment is where analytics processes can be designed, created, and then deployed. Visual presentation and models can also be made and processed here. All of these can easily be done by the users because of the friendly environment. The system provides the users with the right set of tools which makes relevant uses of even the most disorganized, uncluttered and seemingly useless data. This can be accomplished by enabling the users and their team to structure data in an easy way for them to comprehend. To do this, RapidMiner offers capabilities that simplify data access and management that will empower users to load, access, and evaluate all types of data such as images and texts. Not only does the system allows the usage of any data but it also gives them the opportunity to create models and plans out of them, which can then be used as a basis for decision making and formulation of strategies. 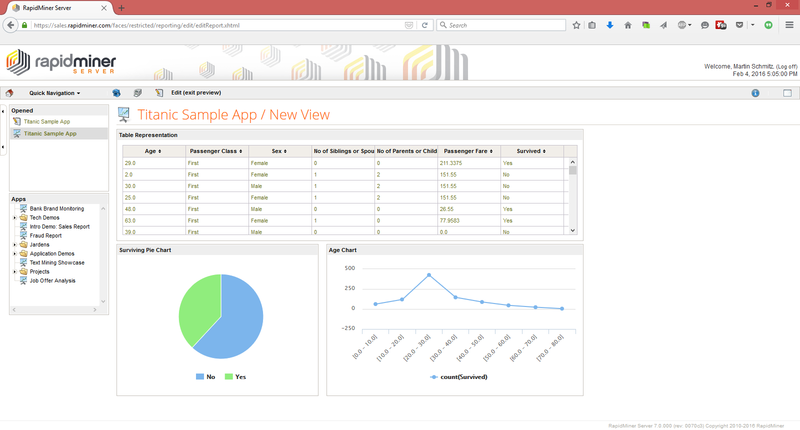 RapidMiner has data exploration features, such as descriptive statistics and graphs and visualization, which allows users to get valuable insights out of the information they gained. RapidMiner is also powerful enough to provide analytics that is based on real-life data transformation settings. This means that users can manipulate their data any way they want since they have control of its formatting and the system. Because of this, they can create the optimal data set when performing predictive analytics.